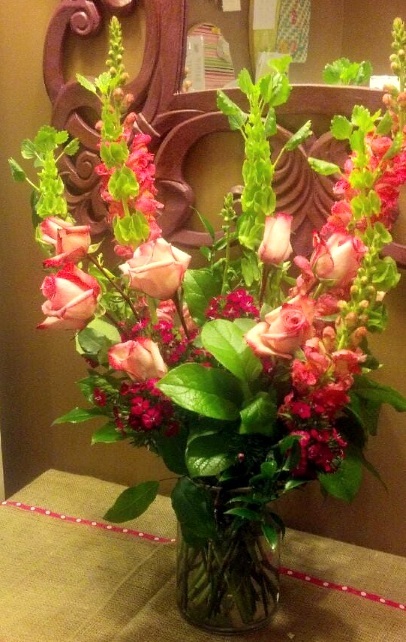 At Betty B's Florist and Hallmark, we deliver the freshest flowers and brightest smiles! We’re a local Henderson, North Carolina florist with over 35 years of floral design experience. Our shop is family-owned and operated and offers a wonderful variety of fresh flowers, plants and unique gifts for all occasions. We hope you enjoy your online shopping experience with secure 24-hour ordering right at your fingertips. If you prefer, call us to place orders direct at 252-492-8555. 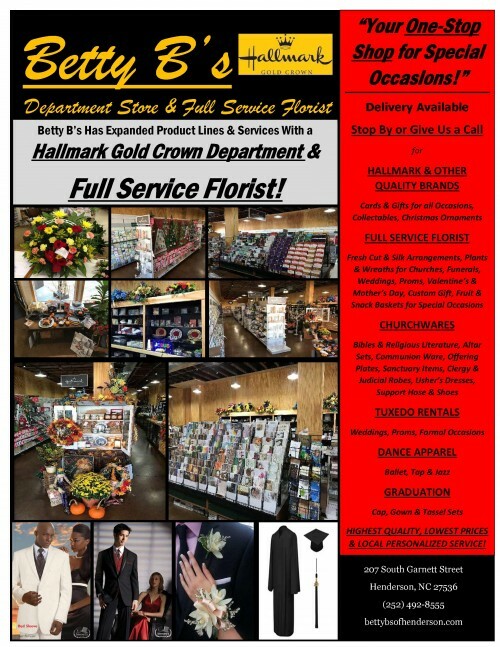 Betty B's Florist and Hallmark is open to serve your floral and gift giving needs: Monday through Friday 9:00 am to 5:00 pm and Saturday 9:00 am to 12:00 noon. Closed Sunday. Holiday hours may vary and private appointments are available. Ask our staff about custom-designing a tribute of flowers to a departed friend or loved one. We can help you choose a funeral arrangement that thoughtfully conveys your expressions of sympathy and serves as a lovely memorial to the deceased. We have been designing wedding flowers for many years. Let us help you plan the flower arrangements and on-site decorating for a memorable wedding, corporate function, holiday party, or any special occasion - large or small. Call Betty B's at 252-492-8555 in advance and schedule an appointment for consultation. Browse our variety of Dish Gardens, Green Plants and Blooming Plants for gifts that will bring life to any room or office. We also offer Fruit Baskets, Gourmet Baskets, Gift Baskets, Baby Gifts, Plush Stuffed Animals, Candy, Balloons, Silk Flower Arrangements and more. Thank you for visiting our website for flowers delivered fresh from a local Henderson, NC florist, Betty B's Florist and Hallmark.